A Catholic Mom’s Prayer Companion Book #Giveaway! Do you ever wish you had a little friend who’d sit on your shoulder and whisper words of affirmation, encouragement and hope into your ears throughout your days as a mother? Or maybe you’d like to spend more time in prayer but don’t know how or where to start? Maybe it’s hard to carve out too much time in the day for anything too long? I’ve got just the book for you! 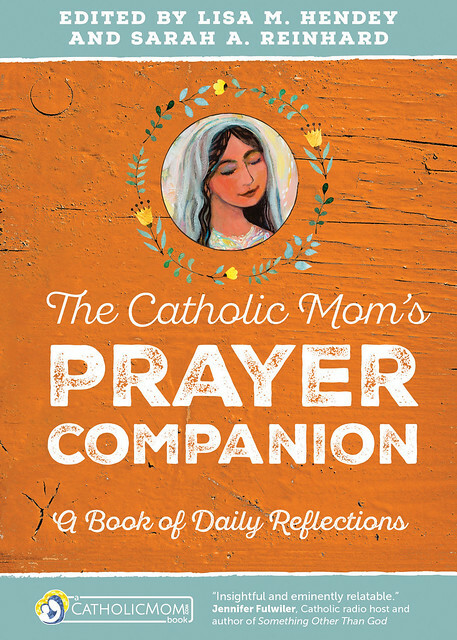 The Catholic Mom’s Prayer Companion, A Book of Daily Reflections is the perfect bite-size daily portion of reflection, prayer, and something to ponder on and nourish you throughout the day. Not too long, not too short, just enough to plant seeds of thought and prompt the soul to go deeper. Whether it be a few minutes before everyone wakes up in the morning or before going to bed, during a short afternoon break, or while I sit in the van at school pick-up time, I’ve enjoyed all the reflections and I look forward to reading the next day’s. I’ve been part of the CatholicMom.com community of writers since 2010 (I think?) and it’s been so fun to see how we’ve grown over these years. As I mentioned in my previous post, I’ve always dreamed of becoming a real true published author so even though I only contributed 4 daily reflections for the year (hence the 1.10% published author stat) I feel humbled and grateful to be a part of this book with so many other great authors and Catholic moms (and dads!). I’ve read every day’s reflection so far since I received my book and am amazed at how the Holy Spirit works – every day, the reflection is about something I’m either currently struggling with or have been silently mulling over for some time. Jeff Young (aka, @CatholicFoodie) reminded me that suffering with Christ is a whole lot better than trying to suffer alone without Christ. Chaunie Marie Brusie (blogger and author of Tiny Blue Lines) challenged me to humble myself and accept my husband’s help instead of trying to do all and be all to everyone all.the.time. Susan Bailey and Deanna Bartalini called me out and got me to stop focusing so much on my weaknesses and failures as a mom and wife and instead love myself and allow God and my husband and children to love me for my strengths. I know motherhood is hard and your kids are driving you crazy and you feel like an awful ugly mother today but, truly, you love your family, they love you, and because of this you are a beautiful and GOOD mom. You CAN do this! I hope this book can become your “little friend” on your shoulder (as creepy as that actually sounds) cheering you on throughout your days and challenging you to go deeper, better, stronger as a mother and in your prayer life. I’m excited to work with Ave Maria Press to offer a GIVEAWAY of one The Catholic Mom’s Prayer Companion, A Book of Daily Reflections to one blessed mom!! You can order a book for you and then, if you win, give it to a friend! As an author, you can purchase the book with me for a 10% discount, just fill out this form or email me through my “Let’s Connect” page. Blah, blah, blah, now for the Giveaway part! This book would be an awesome little read each day!